Another interesting keyboard adaptation that I ran across in one my course. This designer is working on a large graphic and needs to drag and drop lots of visual primitives here and there with Illustrator. 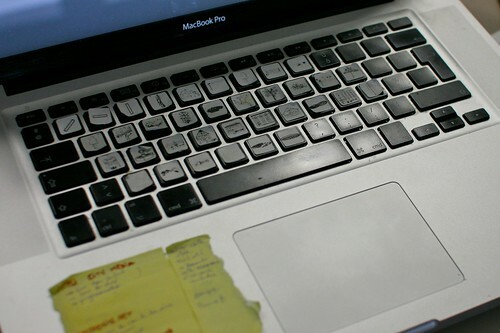 She found it more convenient to use this quick and dirty solution by using tiny stickers with a visual representation of the graphical elements on each keys. Why do I blog this? It's always good when you start clustering examples of user repurposing their own technologies. Along with the French-Cyrillic keyboard hack and fixed keyboard mapping, I now have a cluster of modification that show various possibilities.